“I have seen the millions of dollars wasted on people who come in for a few months, collect huge salaries, write lengthy reports, enjoy farewell parties filled with food and songs and 2 days after they leave no one remembers why they were even here. I see the number of qualified Micronesians here in Hawaii and Guam who don't want to go home simply because they can't find work. I think PREL can be a Xavier part 2. An organization that brings our best people together for 10-15 years addressing and solving the myriad of issues that our country faces then moving on to elected leadership positions after having worked together and proven what they can do,” he wrote. Dr. Vidalino Raatior, PREL Senior Consultant; Shanty Sigrah-Asher, J.D., Education Law Specialist, and Yolanda Joab-Mori, PREL Community Resilience Specialist presented a question and answer session at the College of Micronesia FSM’s MITC room at 1:00 on the topic “Micronesia Rising from Within”. It was designed to discuss the new direction of PREL. The room was packed with standing room only. Certainly everyone in attendance expected the hour long session to be good. Their expectations were exceeded. Dr. Raatior told his own story about reclaiming his name. He said that missionaries baptized one of his ancestors but that those missionaries felt that his name was not “Christian enough” and so they changed that ancestor’s name to “Jones”, which met their standards. Later, when US Peace Corps workers were recording the names of Chuukese people they went by the Western standard of patrilineal heritage instead of Chuuk’s traditional matrilineal line. They only asked what the father’s last name was and so for years, Raatior’s family was stuck with the name Jones until he legally changed it back. It was just one example of outsiders not understanding Micronesia tradition or culture. Both Shanty and Yolanda presented the message that when they began their journeys they often didn’t think that they could do it but they kept pushing. They encouraged the audience, many of whom were COM students to keep pushing to achieve for their own good and the good of the nation. During the Q&A portion of the hour long session at COM, or as Yolanda called it, the “talk story” session, questions were raised on the subject of FSM patriotism and sometimes, emotionally also of the discrimination that FSM citizens face in the US or its territories. The two subjects were linked in the questioners’ minds as they would be. Some talked of having sometimes denied their country of origin in the face of discrimination. A conversation arose about how much easier it is for a Micronesian to say to an outsider that they are a Micronesian rather than a Chuukese, or a Yapese, a Kosraean, or a Pohnpeian but when inside the FSM they are more divided. It’s a patriotic issue but also a cultural one. PREL is definitely heading in a new and right direction. 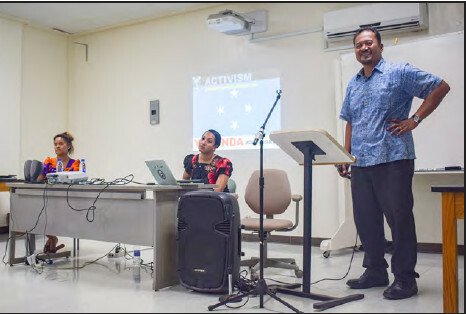 In terms of Micronesia, PREL seeks to build Micronesian-driven projects for nation-building, expansion of capacity-building and networking for FSM citizens, recruitment of recent grads and young professionals, and to assist the FSM on the ground to help address FSM’s social and legal issues abroad.